SMART Central is our portal to access the many automation applications and services that create your operational workflow. SMART Central improves management of and staff access to information and control. SMART Central will revolutionize the way you do business by giving your decision makers immediate access to critical information. By utilizing a true SOA environment SMART Central easily handles new changes, requirements and demands placed on the broadcaster. Simplification is the key to remaining competitive. With SMART Central, simplification is made simple. 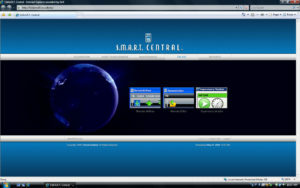 SMART Central includes Inventory Browser, where you can search your database and view low-res copies of your inventory from any networked workstation. Great for Sales, Traffic and Master Control. Pre-air Discrepancy Report (configurable runtime for report; however, usually runs daily, prior to a schedule going to air). Urgent Request Notifications – undetected material needed for air (usually 2 to 4 hrs to air – configurable) triggers generation of an Urgent Request Notification. Critical Request Notifications – for events whose material has not been detected as available for air within a configurable time before air (usually 1 hour to air) triggers generation of a Critical Request Notification. Automated dub and purge list processing. Again, can be automatically emailed or manually accessed. Automated Schedule Import (BXF or native). SMART Central monitors traffic folders and automatically creates Florical Schedules, instantly making them available for on-air. No operator intervention required. Remote Airboss – Control on-air from any networked workstation. Perfect for Dynamic Hubbing or for emergency access to “lights out” operations. Supervisory Monitor – monitor multiple channels on one workstation and directly select any single channel to access for control. Live-Log BXF Traffic interface for two-way communication with traffic. Through emailed “Critical Reports” the Traffic Department can make last minute changes to on-air schedules to head off “make-goods” and if a make-good occurs, Traffic is notified through reconciliation reports and therefore can perform the make-good within minutes and potentially saving significant lost-revenue. Remote AirBoss – Control or view on-air from any networked workstation (AirBoss list license required for each instance of Remote AirBoss). Supervisory Monitor – monitor multiple channels from one workstation and directly select any single channel to access for control. Supervisory Monitor comes in two modes: duration based or event based. Remote Editor – Remote access to view or edit any schedule available from traffic. Inventory Browser – Browse your database and view low-res files of your inventory from any networked PC; Great for sales, traffic and Master Control. Live Log traffic interface for two-way communication with traffic. Traffic is notified of missed spots or errors and can immediately “make-good”.